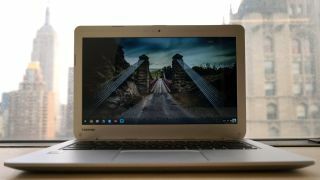 Chromebook are attractive to businesses and consumers alike. VMWare is teaming up with Google and Nvidia to bring high-performance virtual desktops and workstation-class graphics to the increasingly popular Chromebooks. More specifically, VMWare will be bringing its Blast Performance technology to the table while Nvidia's GRID virtual GPU technology will be used in the backend. What the trio seek to achieve is delivering desktop-quality performance in a virtualised environment via a Chrome browser using HTML5, with Nvidia's hardware doing the number-crunching in the backend and VMware's Horizon supporting it. Although the solution will work across all Chromebooks (regardless of whether they're ARM-based or x86), Nvidia confirmed that it will work better with its own hardware thanks to the "exclusive Nvidia Tegra decode technologies". The latter can extend battery life by up to 50% and can be found in the new Acer Chromebook 13 which is powered by Nvidia's Tegra K1 SoC. Expect this tightly-integrated solution to be rolled out to selected Nvidia and VMware customers towards the end of 2014. Within a classic Microsoft Windows environment, VMware suggests that demanding applications such as Adobe Illustrator CC, Autodesk AutoCAD and Microsoft office will be fluid. So it seems that the thin-client vision of the early 1990's is alive and kicking with an unlikely passionate evangelist, Google, taking on entrenched players like Microsoft or Apple in a number of verticals.